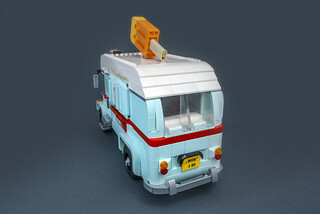 I don't know if it's the influence of Tom Waits, Jim Jarmusch or who, but I really like ice cream vans. There are not many things in nature that colour and I wanted a challenge to see if it's possible to build something in Light Aqua. I used almost every element that was available in that colour. Not based on any existing make, it is just an imaginary model based on 50's design cues.